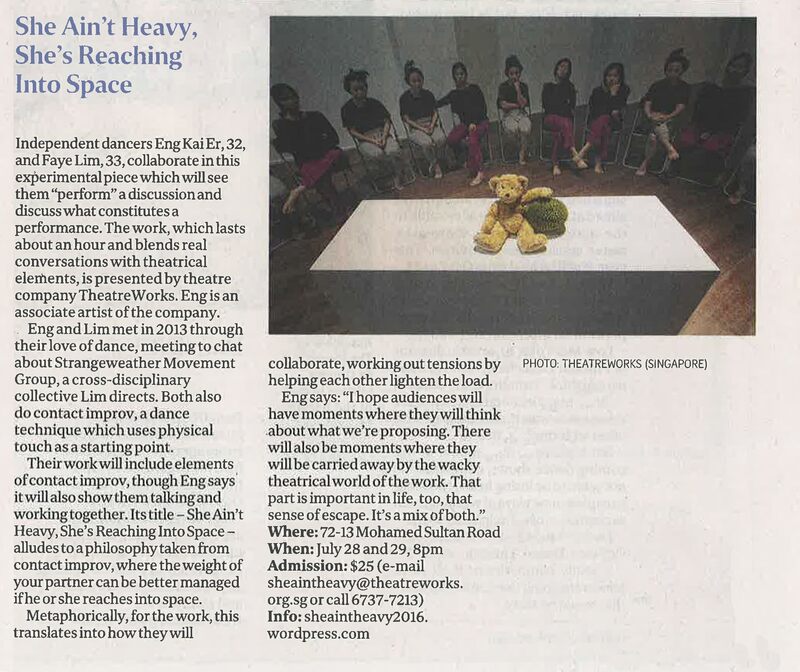 She Ain’t Heavy, She’s Reaching into Space was featured in the Straits Times Life section, on page D2 today! Find out more about how they met, what the work entails and the meaning behind the title of their piece! We still have tickets for both nights, email us at sheaintheavy2016@theatreworks.org.sg or call 6737-7213 to book your tickets today! A chat with Tze Toh, our Music Arranger. With an intuition in music and sound design, the award-winning composer-pianist Tze Toh is working hand in hand with Faye and Kai to highlight the emotional genuineness within their performance. Having a passion and strong drive to continually improve his work, Tze Toh has made an impact in the Singapore arts community with his authentic arrangements and compositions. Most recently in 2015, Tze Toh created and presented his own music, sound design and story in the LAND with NO SUN : Promemoria in Esplanade. We are thrilled to have him as part of the production team. In She Ain’t Heavy, She’s Reaching into Space, Tze Toh will be looking to project the emotional subtleties and conveying strong messages through his composition as Kai and Faye work their magic on the dance floor. As Tze Toh continues to strive for originality in his music, we thought it would be a good idea to chat with him about his work. Despite being an Associate Artist with TheatreWorks for only a year, Eng Kai Er is no stranger to the realm of unconventional performance. Picking up dance as a CCA at the tender age of 9 years old, Kai’s bold character and passion for dance took her on a path of discovery, in which she experimented with different dance forms and performance styles. Most recently in 2015, Kai had collaborated with Bernice Lee and Jereh Leong to present Indulgence, where the title alone speaks volumes on what the performance is about. This year, together with Faye Lim, their collaboration explores their interpretation of a dance form called Contact Improvisation, a contemporary dance form that is intimate, resulting in a different outcome every time. We’re less than three weeks away from the opening of She Ain’t Heavy, She’s Reaching Into Space, and we spoke to Kai about her anticipation and feelings about the upcoming production. We also reminisced about Indulgence, and found out a few quirky things about Kai too! She Ain’t Heavy, She’s Reaching Into Space is heavily inspired by Faye and Kai’s practice of Contact Improvisation, and every year they get the chance to attend a weeklong festival called the Contact Festival Kuala Lumpur (CFKL). As we already have an early definition of Contact Improvisation, the CFKL in particular is a “friendly small-scale international festival [that] seeks to gather practitioners, teachers, dancers, students, and the public where participants can exchange knowledge and study with experienced teachers”. Over a span of a week, participants engage in “various activities to facilitate their own investigation into movement material and to find avenues for collaborating with others”, making it a highly stimulating and creative environment. Check out this sneak peek of She Ain’t Heavy, She’s Reaching Into Space! We are THREE WEEKS away from the opening performance! Get your tickets now by email at sheaintheavy2016@theatreworks.org.sg or call 6737-7213. What Exactly is Contact Improvisation? Want to find out more about Contact Improvisation, or witness it first-hand? Keep an eye on this blog as we will be providing more bits of information! Stay tuned! Back in April, Faye and Kai had an Open Rehearsal – which was a work in progress showcase as they developed their duet performance ‘She Ain’t Heavy, She’s Reaching into Space‘. Now, as we’re nearing the performance, let’s take a look back towards the Open Rehearsal!